20 on/off settings. 16A resistive, 8A inductive. Shortest switching cycle 1min. 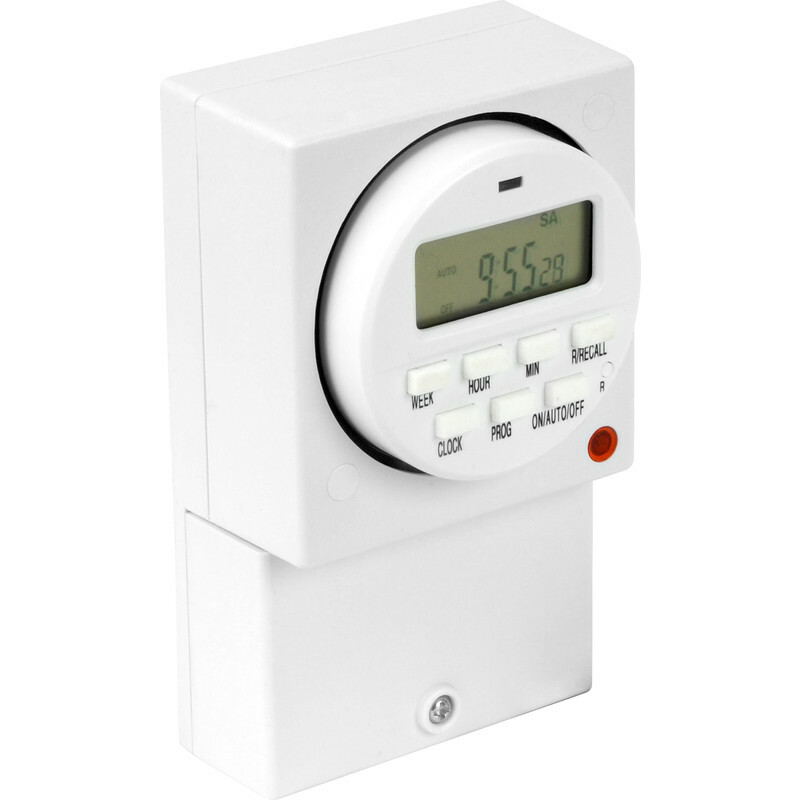 7 Day Surface Electronic Timer 16A (8A) is rated 4.8 out of 5 by 9. Rated 5 out of 5 by Marky the sparky from Great product and easy to set up. It was reasonably priced and available. Rated 4 out of 5 by DYLAN12 from Easy to fit Bought this to relace a different more expensive make that packed in within a year. This was very straight forward to fit only downside is the digital screen is so small I have difficulty reading the screen.Time will tell how reliable it is. Rated 5 out of 5 by LPMCCnet from Better than it says! Not difficult to set up. The most amazing feature, not mentioned in the description, is that it contains a rechargeable battery that keeps the time and settings even if the power is switched off, fuse blows or there is a power cut. Rated 5 out of 5 by Why 1 from Easy to wire up Really easy to wire up and set the clock and on/off times. Quick delivery aswell so very impressed. Rated 5 out of 5 by Furnace 73 from Reliable timer This is the fourth timer of this series that I have purchased, controlling two sets of outside lights, a pumping circuit and power to an immersion heater. They are reliable and easy to programme. Rated 5 out of 5 by KateS from Great, easy to use I bought this last week and an electrician installed it for us (our last timer broke). It is easy to use and is doing the job well! Rated 5 out of 5 by ledman2017 from Simple to Install & Use I bought this to control a colour changing LED floodlight in the garden. It is very easy to install with large terminals that are clearly marked. The cover also has cord grips to secure the cables. Instructions for programming are not as clear as they could be but it is very easy to set up and use without referring to them too much. 20 on/off settings is a lot of options but you don't have to scroll through all of them to complete the set up.